should be requested for a more complete physical picture. A blood test can reveal so much about your body, but only if you can interpret the results. 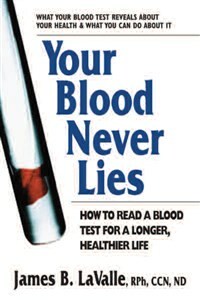 Your Blood Never Lies provides the up-to-date information you need to take control of your health. "Arguing that blood tests should be read much like trends in the stock market, LaValle urges readers to probe deeply and examine the results, employing the blood test as a preventive-care tool that can help ward off such problems as diabetes and heart disease . . . This patient-empowering text will help readers decipher their blood test results, and, more importantly, it serves as a guide to preventative care." " . . . taking a closer look at your results might lead to making healthy changes." "In an era when health care is being reduced often to imaging studies and lab tests, Your Blood Never Lies . . . emerges as a valuable tool to layperson and physician alike . . . a thorough examination of an area in which far too many patients have known far too little for far too long." James B. LaValle, RPh, CCN, ND, has been involved in natural medicine for over twenty years. Known as “America’s Pharmacist,” he is a nationally recognized figure in the field of natural therapeutics. Dr. LaValle’s experience ranges from extensive clinical practice, product design and formulation, and technology development, to author, educator, and media personality. He maintains a clinical practice at Pro Scan International.